The report won't come as a surprise to informed people, as emphasized by Quebec presenting incentives for industry to locate/grow by using it's legacy hydro assets to discount rates. MONTREAL -- The Quebec government wants to use its energy surpluses to offer a discount on industrial electricity rates, but appears to have closed the door on giving residential clients a break. Energy Minister Pierre Arcand and Jacques Daoust, the economic development minister, proposed a 20 per cent discount Tuesday on current hydro rates to encourage investment and new projects in the province. Arcand said Quebec has had a reduction in its energy needs because of difficulties in the pulp and paper sector combined with increased supply. The two ministers said the new industrial rate should generate tax spinoffs of more than $800 million for the government between 2015 and 2024. 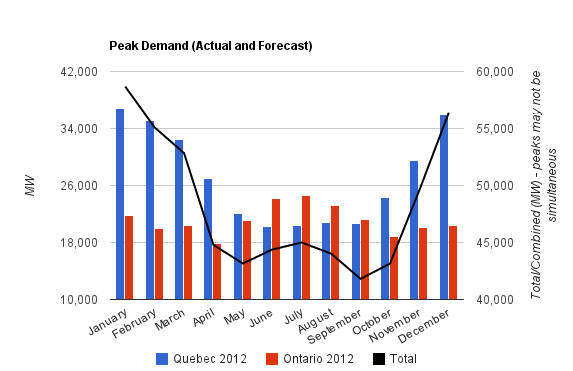 Some details on the Quebec program are at Canadian Energy Perspectives.